Spiders are related to insects but are distinctly different. Spiders and insects are both arthropods; that is, animals with an exoskeleton (their skeletons are on the outside of their bodies) and jointed legs. Spiders are closely related to mites, ticks, and scorpions and are collectively known as arachnids. 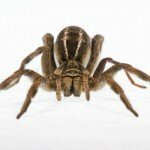 There are many different types of spiders and a few poisonous indoor spiders. The black widow prefers dark, secluded places to place her web and catch prey, and it is nocturnal. The female also guards her cup-shaped egg sac until the spiderlings hatch. Brown recluse spiders also do not exhibit common house spider behavior. They prefer dark, secluded places, but their webs are not meant to catch prey. The actively hunt. The Hobo, or aggressive house spiders, prefer to spin their funnel-shaped webs near ground level. These webs serve as both traps for prey and shelter for the spiders. When prey vibrates the funnel, the hobo emerges from the narrow end for a meal. Typically, you will know if you have a spider infestation because you see spiders and their webs in your home. If you start to notice an increase of spiders, contact Bigfoot Exterminating as soon as possible to eliminate spiders from your home.